. :: GERMANY AND AUSTRIA CLAIM EUROPEAN CHAMPIONSHIPS VAULTING GOLD ::. 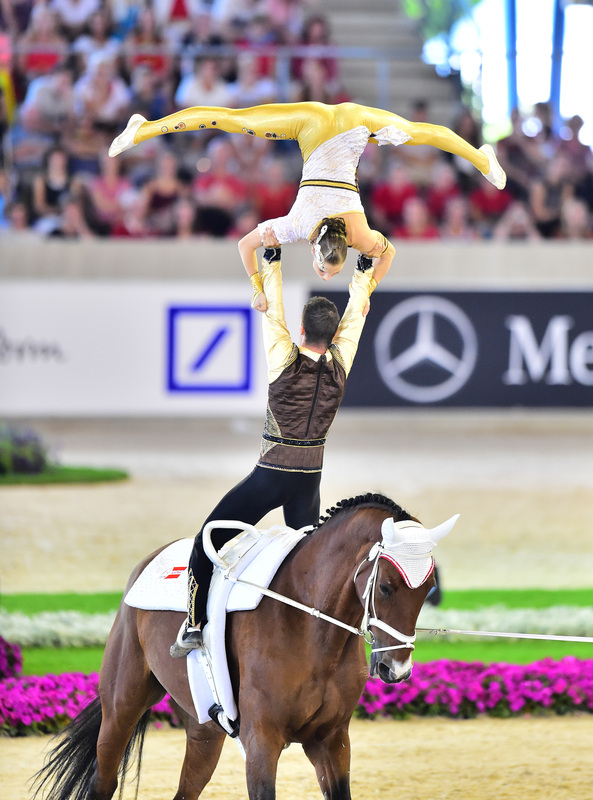 Host nation athletes dominated the Individual Male Final while Austria claimed both gold and bronze in the Pas de Deux at the FEI European Vaulting Championships 2015 in Aachen (GER) yesterday. Over 5,000 spectators roared with delight as relative newcomer, Jannis Drewell, pinned fellow-Germans Thomas and Viktor Brusewitz in silver and bronze when producing a stunning final Male Freestyle test. But there was no big surprise when Austria’s Jasmin Lindner and Lukas Wacha came out on top in the Pas de Deux. The nine pairs in the Pas de Deux were representing seven countries, and former Vaulting superstar, Joanne Eccles, was lunger for the British pair who were first into the arena this afternoon. Eccles, who claimed Pas de Deux and individual gold at last year’s Alltech FEI World Equestrian Games™ in Normandy, France didn’t put herself forward for individual selection for the 2015 Championships, but she has been training Andre McLachlan and Rebecca Norval and their equally inexperienced horse, Norval, who got the competition underway with a score of 5.459. Hungary’s Reka Gadolla and Reka Csordas upped the target when posting 6.806 before Switzerland’s Zoe Maruccio and Syra Schmid moved out in front when putting 7.171 on the board. Dutch sisters, Carola and Esther Sneekes were awarded 6.690 by judges Jochen Schilffarth (GER), Veronique Girard (FRA), Gaby Benz (ITA), Pavla Krauspe (SVK), Doris Knotter (AUT) and Monika Eriksson (SWE) before Switzerland’s Evelyn Freund and Stefanie Millinger set the arena alight with a great test that put them way ahead on a mark of 8.672. Their powerfully-build horse, Robin, supported their adventurous programme that drew gasps of delight from the spectators and a strong technical mark of 9.005 from the judging panel. But the Swiss pair were immediately overtaken by Germany’s Pia Engelberty and Torben Jacobs. Lunged by former champion Patric Looser, the duo forged another new lead when earning 8.725. 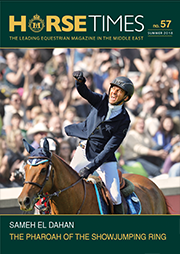 Jasmin Lindner and Lukas Wacha are an extremely polished pair, however, and with their eye-catching 1.90-metre-tall gelding Bram they were always favourites to take the title. Once again they combined power, balance and seamless transitions throughout their two-minute programme, and when 8.990 went up in lights there was no question about the destination of the gold medals. The last pair, Germany’s Gera-Marie Grun and Just Van Gerven finished just off the podium when slotting into fourth with a score of 8.469. With yesterday’s results added to those from the day before, Lindner and Wacha completed on a final tally of 8.853 for gold while Engelberty and Jacobs rounded their score up to 8.725 for silver and Freund and Millinger took the bronze with 8.557. “I’m very happy, it’s a super feeling to be here with so many spectators applauding, I can’t describe it!” Lindner said this evening. And silver medallist Torben Jacobs was also delighted with his result. “We wanted to show a Freestyle with a lot of expression. These were two good days for us”, the German vaulter said. It was a close-fought all-German affair in the battle for the Male Individual title, with Thomas Brusewitz pinning the eventual champion Jannis Drewell into runner-up spot in this morning’s Technical test in which Viktor Brusewitz lined up in third. Hungary’s Balazs Bence set the target in this afternoon’s finale to decide the medal placings, scoring 7.808 with his Aladdin-themed programme when seventh to go of the 15 starters. And then Clement Taillez went out in front on 8.052 before fellow-Frenchman Vincent Haennel’s brillliant dismount from Quartz d’Olbiche helped him establish the short-term advantage when awarded 8.133. Thomas Brusewitz’s tiger-stripe costume has been attracting plenty of attention and, even with an early mistake, the younger of the Brusewitz brothers went well ahead with 8.563 for his performance. But older brother Viktor presented a routine that was all drama from start to finish. Together with his imposing horse, Rockard, and lunger Winnie Schluter, he brought the crowd to their feet when a mark of 8.563 went up on the board. But the excitement wasn’t over yet. There was real electricity in the air as Jannis Drewell and his grey horse, Diabolus, began the final test of the competition. The 24-year-old has made a big impact this season, but in his very first Championships it was difficult to know what to expect from him. He has risen to the challenge with incredible ease however and, having been highly competitive all week, he just blew all the rest away with a spell-binding final performance today. In his costume, representing a monk in orange robes, and with his musical score from Kung Fu Panda, he showed extraordinary suspension and amazing speed, even managing to include some kick-boxing as he racked up big scores. He clearly knew he’d done something special despite a relatively cautious final dismount, and he burst into tears when he heard he had been awarded 8.732. Combined with his results from the Compulsory and Technical tests along with his first Freestyle, he was left on the winning total of 8.369, ahead of Thomas Brusewitz with 8.343 and Viktor Brusewitz, whose score rounded up to 8.157.